Santiago Perez’s art is a weird mash-up of cartoons, the Renaissance paintings of Hieronymous Bosch, classic alternative comics by R. Crumb, mythology, and other stuff. 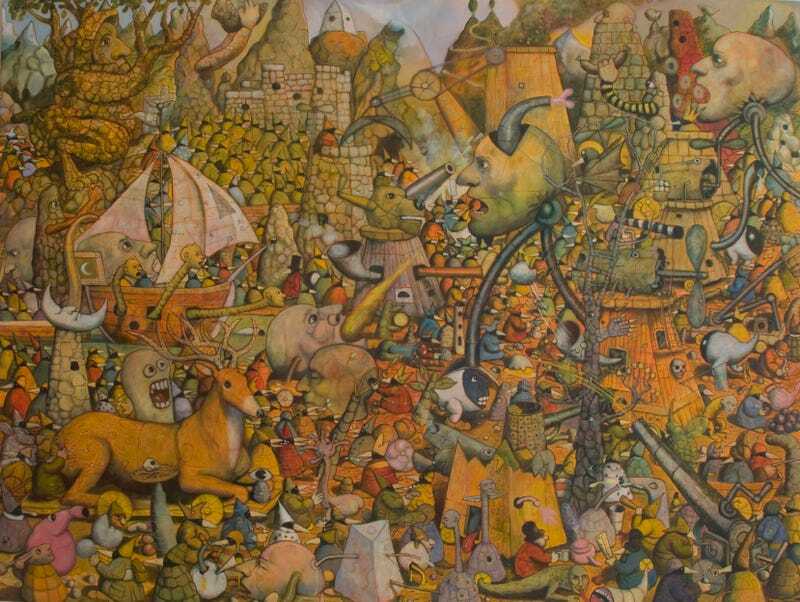 But his work reminds me of nothing so much as really weird fairytales. Perez started making these weird paintings when he was in the U.S. Air Force, and he did gallery shows in Colorado and Germany while he was still enlisted. Since he retired from the Air Force, he’s been working harder on his surreal vision. And now he’s got a gallery show in his native New Mexico, at the Oasis Learning Center in Albuquerque. The installation, called “The Fantastical World of Fantomas: The Imaginative Paintings of Santiago Perez,” runs through April 22, and includes paintings with titles like “Baby Snookums Walks with Harry, Her Favorite Reptile,” and “The Murgatroyd Pilot.” We were so blown away by his images, we asked him for permission to run a few of them at io9. The image above is called “The Battle of the Mergatroids and the Hubots,” check out more below.